Sixty two graduating interior design students applied lessons they learned in college by renovating daycare centers and a health center in Manila. DESIGNING THE COMMUNITY. 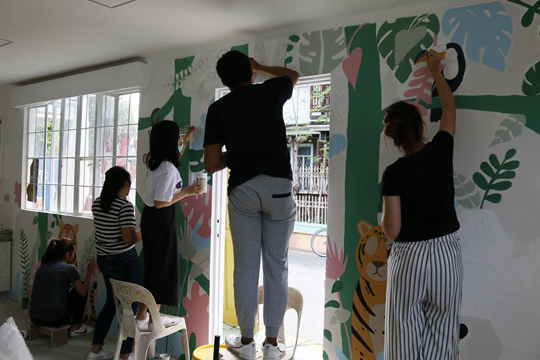 Graduating interior design students paint the walls of Barangay 739’s daycare center with images inspired by Philippine Origin Stories. The project, dubbed “Odyssey: Seeking Adventures Through Timeless Local Folklores and Its Morals,” brought De La Salle-College of Saint Benilde students, divided into three groups, to Barangays 739, 752, and 745. This community project integrated design principles and theories the students learned in their classes and translated those into social responsibility. “It started as a class requirement which helped us to maximize our skills and create substantial impact among the members of the community,” shared project leader Bianca Barican. Children from beneficiary barangays in Manila grace the ‘Odyssey’ exhibit at S Maison. The students took inspiration from the country’s abundant folklore and the lessons attached to those. The batch redesigned the daycare centers and healthcare center into more adaptable and flexible spaces for the kids and the rest of the community with materials and facilities that are multipurpose in nature. 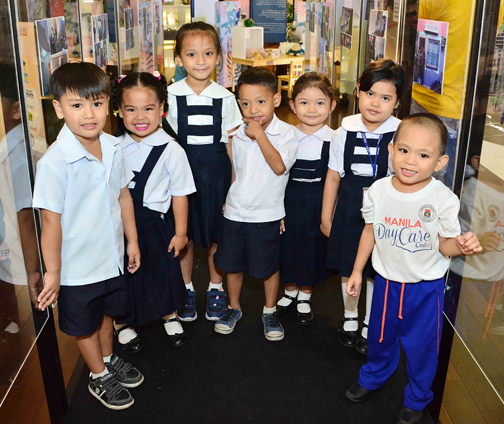 The group that headed the renovation for Barangay 752 Daycare Center replaced the old big cabinets into more compact shelves to have a wider sitting room for the pupils. The ceiling was repaired and designed with a butterfly wing to inspire children to be more creative and artistic. Their inspirations were Philippine folklore Alamat ng Bulaklak and Paru-Paro. Meanwhile, the unit for Barangay 739 Daycare Center likewise changed big cabinets into colorful shelves to provide more comfortable sitting. At the same time, the daycare’s walls were painted with plants and animals to encourage curiosity, creativity, and connection that interplays with tradition, nature, and contemporary life. The concepts behind these designs were Philippine Origin Stories. Fun colors and multi-purpose facilities improve the classroom experience of young students in Manila. On the other hand, the team for Barangay 745’s Health Center revamped the Monobloc chairs into seats with foams for comfort, durability, and ability to support weight. The walls were designed with images of ancient Filipinos and mythical creatures, following local myths. Several fundraising campaigns such as garage sales and selling of student-made merchandise were held to ensure the success of the projects. The transformations took a month to be completed. In gratitude for the opportunity to make a difference in the lives of neighbors, the batch concluded the project by distributing food and treats to kids and senior citizens. “To all who worked hard for the success of Odyssey and to those who we hope we helped make their lives a little brighter through their spaces, thank you for all the patience and cooperation for making certain that this project became successful. We all learned something from this heartwarming experience,” shared Barican.